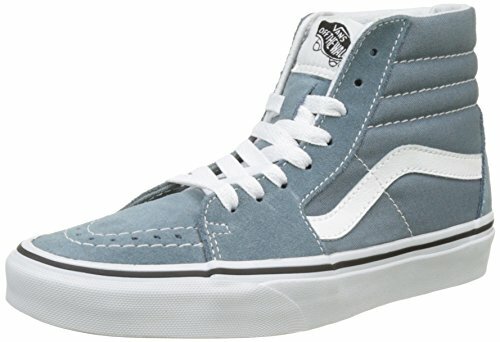 Vans Unisex Adults’ SK8-Hi Trainers, Blue (Goblin Blue/True White), 3 UK 35 EU. The Sk8 Hi is one of a legend and heritage of legendary high top trainer the first hour. Always It impresses with high-quality material and is always stayed true to itself. The material mix of canvas and suede and smooth leather for a stylish look and a superior durability. Thanks to the padded ankle collar and an additional padding in the tongue provide a comfortable fit and ensures long lasting comfort. Also, this sneaker is with its distinctive outsole with a waffle design and the traditional logos to the heel. This Classic thanks to its 8 hole boot and the classic colour scheme numerous carrying options, for your casual outfits, Easy is essential.